El Ranchito used Golaem to create a White Walkers army surrounding the Brotherhood in a daunting moment of Game Of Thrones Season 7. They kindly detail their process and pipeline for us. El Ranchito crowd team, Oscar Marquez (Crowd Lead) and Jordi Camps (Crowd TD), delivered around 200 crowd shots, around 60 unique shots with its own simulation, including Golaem characters for Game Of Thrones Season 7. 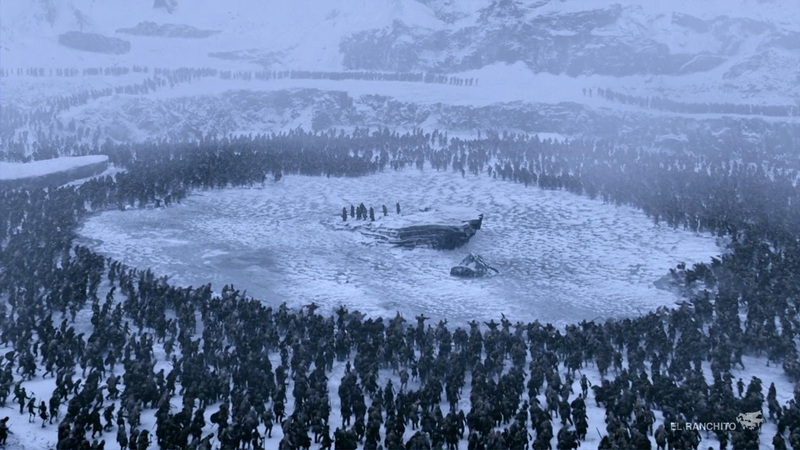 Most of them are in the 20 minutes battle scene happening on a Frozen Lake in Episode 6. In this scene, our hero and his group of friends are besieged by the Army of the Dead. 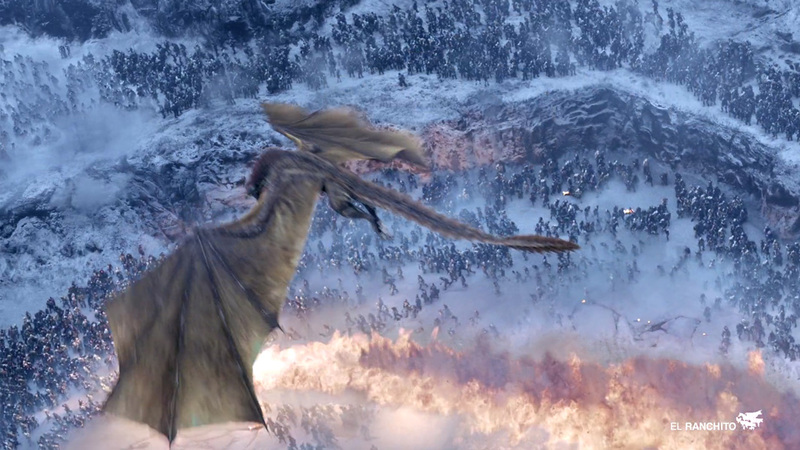 After defending themselves against an epic attack, they are saved in a huge battle of dragons. As every penultimate episode in a Game of Thrones season, Episode 6 is made to be spectacular and visual effects are very impressive. Although some shots are full CG, foreground live-action crowds were also used, which adds to the challenge for VFX artists. Indeed Oscar explains: “We had to deal with the same speed, including some slow motion shots, as the real crowds with our cg crowds and also to match their style with fx interaction and cloth simulation. To achieve that control in our agents we captured five sets of locomotions with several variations to give more range of movements to our agents. We also had a big library of motions with different walking, running, crawling, idles, specific actions and poses to make additions to our Army of the Dead ”. Some shots feature in total up to 100 000 wights. They were created by separating crowds in different levels, as Oscar details: “The first level usually had fore and background crowds, depending of the live-action crowds plates. We prepared different kind of simulations libraries depending on the crowds behaviors: excited, walking, run to the battle, with or without cloth sim…”. 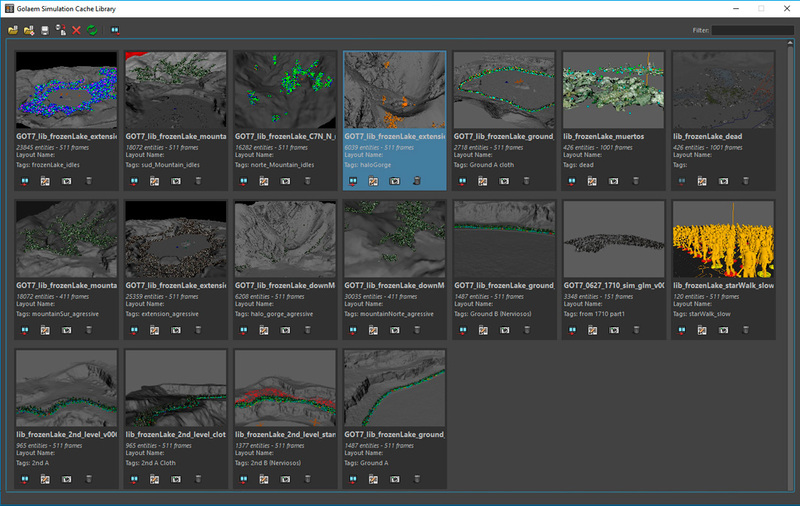 The team spent two months on pre-production including the time they need to setup the workflow and integrate Golaem into the El Ranchito pipeline. “Delivering so many shots with this quality was a crazy amount of work, but Golaem made this possible. It was so easy, thanks to the atomized Goalem files system we were able to smoothly flow one shot from the asset creation to the final render in only one week, and it took us around 3 to 4 months to deliver all these shots”. El Ranchito is a Spanish visual effects company for film, television and advertising. Created in 2004, El Ranchito has participated in the postproduction of over one hundred spots and more than seventy films and television series, many of them for the international market. The work of El Ranchito has been recognized with seven Goyas in the section of Best Special Effects and with three VES (Visual Effects Society Awards) for Game of Thrones and The Impossible.